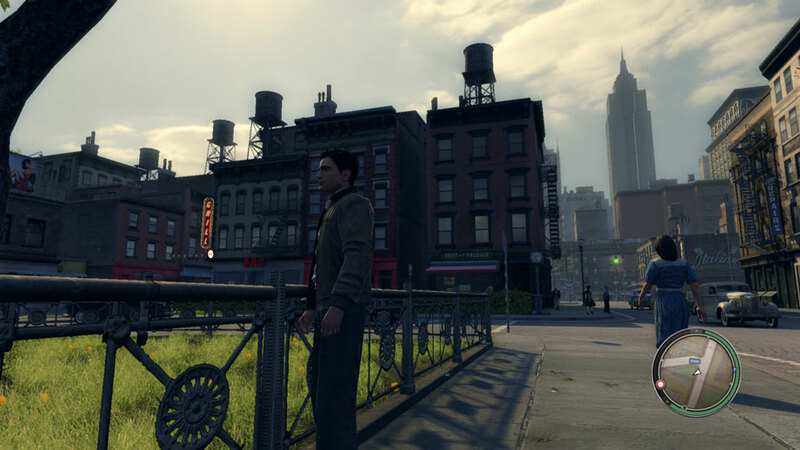 The graphics in this game are very impressive, not quite as impressive as was shown earlier in the game’s development but that’s usually expected in most games. This section is longer than usual, if you’re not into the graphical quality of games you won’t miss anything by skipping it. 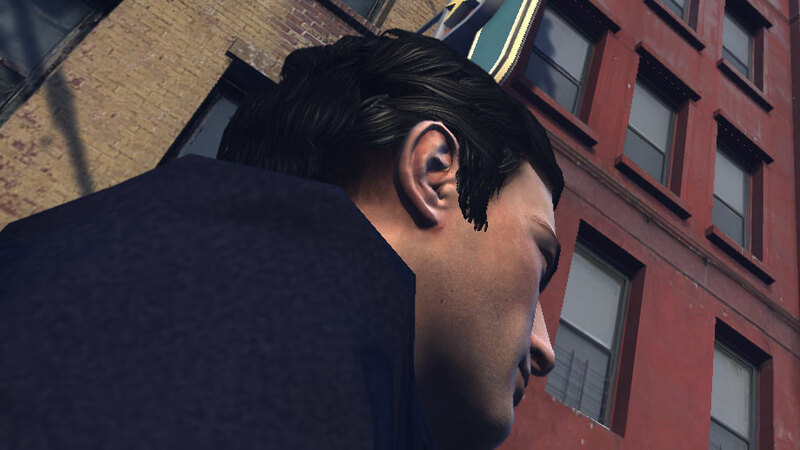 The textures in this game look great, characters in general are of an exceptionally high standard, they’re done with a level of quality that you don’t always see, though the hair sometimes looks a little plastic close up. The general environment varies quite significantly however, indoor areas tend to have very high quality textures whereas outdoor areas, such as building walls can be very blurry at the same distance. Roads are great, especially with snow or rain on them. Here are some examples of bad textures, they’re not exactly in hard to reach places. Cars also shine in this department, just like the characters they are consistently of high quality and it’s hard to fault them, each look (snow, wet, damaged, dirty) is well done, here are some examples. This game suffers from quite a bit of tiling, mainly with grass and shrubs, but while most games have this occur at a distance, it’s obvious at close distance with this game as well. 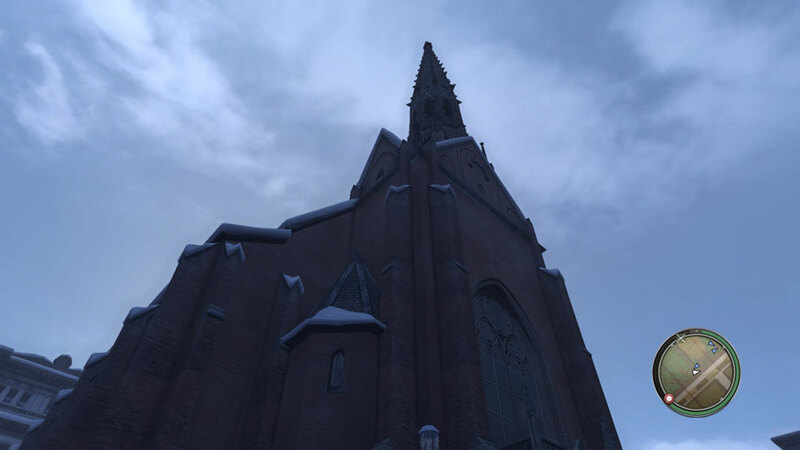 The models are very well done, though the game doesn’t support Direct X 11 and tessellation, it’s able to produce some very smooth models, not quite as good as the preview images showed, but it’s close. Damage of cars is done well and you really have to damage the car badly before you see any oddities occur, though it also gets into PhysX which can sometimes create some odd shapes. Objects in the back of trucks are highly detailed. 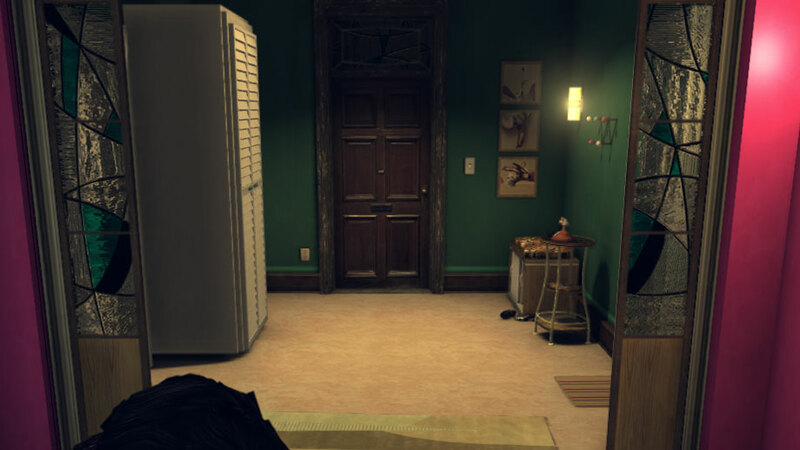 The characters again are done well, the faces are smooth and detailed, the clothes actually look like they have more than 1 dimension to them, ie the fabric has thickness, something that I first observed in The Saboteur, it really helps to create a realistic gameplay experience. 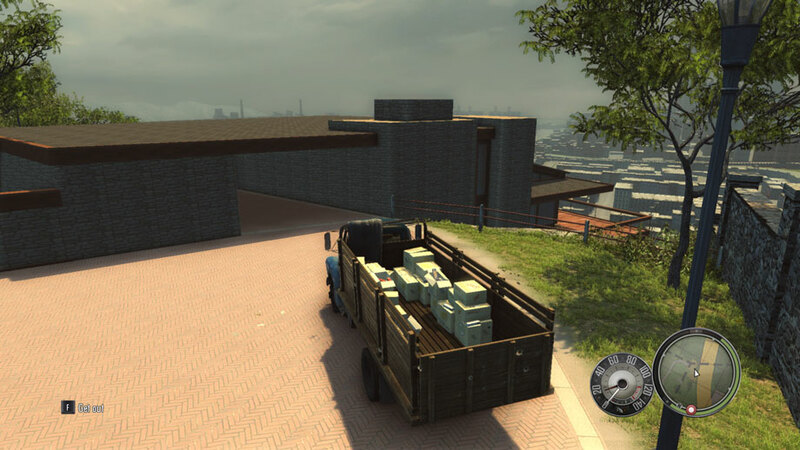 Most of the buildings are quite boxy and simple, the level of detail varies widely and some look more like unfinished placeholders, trees are done well however, they’re not the best out there but they are certainly up to the level that we’re used to in most games. Character animation is awesome, it’s fluid and bug free, unfortunately APEX PhysX messes with the clothes sometimes, with it off however there are no problems. Here’s a YouTube video from the demo showing character animation. In game anti-aliasing just like in the demo doesn’t really do much, however with the correct AA compatibility flag Nvidia users can force Multisampling AA on and it works perfectly, though it does have a huge performance hit and on my PC it would give artifacts and cause the game to crash occasionally. Perhaps a new compatibility flag would fix those issues. Here is a sample of a scene with no AA and with forced 8xMSAA. This game is quite bright and colourful and it works well with the time the game is set in, early in the game it’s winter and the snow is very well done, bumping into a parked car that has snow on it will cause the snow to fall off, when starting a car that has snow on it, the snow will slowly melt, though this seems a bit fast and doesn’t look very realistic. The smoke and fire effects in this game don’t get mentioned much but they do look amazing, however the rain effects are possibly the best I’ve seen in a game, it even shines in the car’s headlights as it should, leaves on the ground in places also add to the general polish of the game. Flags don’t move, at all, not even with APEX PhysX on max, this is a bit of a gripe because it’s so obvious that it would be something they would animate for a game that’s supposed to be showing these kind of effects off. 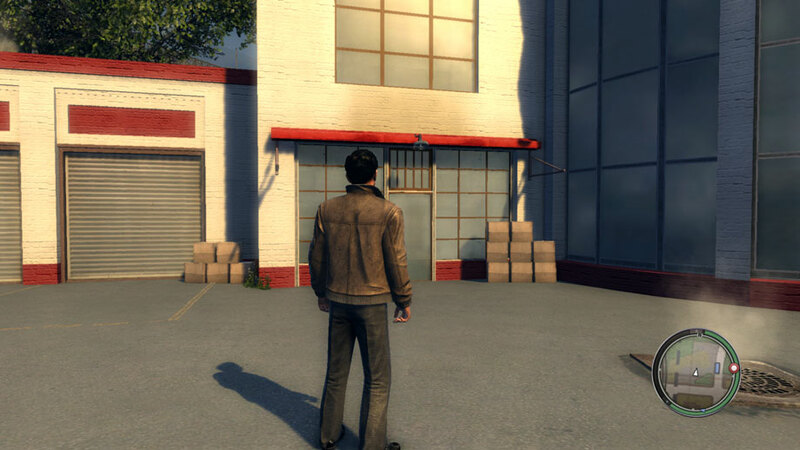 This game world feels unfinished, sure the stuff that is done and is shown in the game looks great, but if you look even slightly below the surface there are so many variances in the quality of objects, buildings that look like placeholders or copy/pasted from elsewhere, or look like they were created years ago in low quality and were never fixed up. There’s less variance from tree to tree or shrub to shrub which causes the aforementioned tiling issues and character models are so few that there are way too many clones walking around in one area at a time (I’ll get to that in “Gameplay”). This game is a great example of what sound in games should be like. 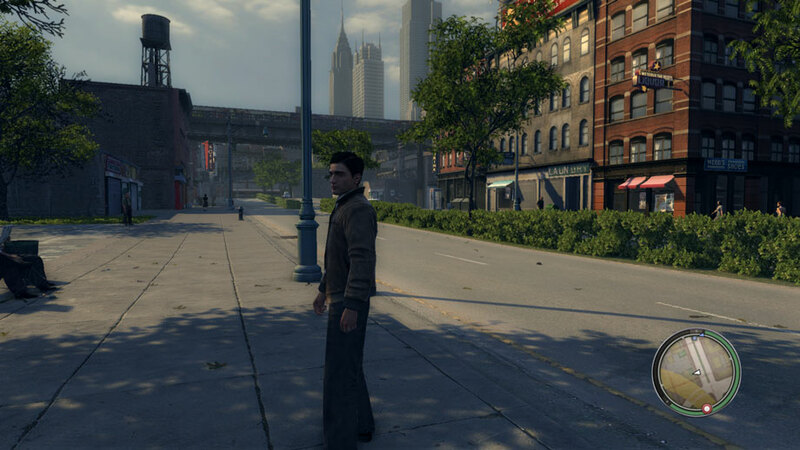 Mafia 2 has a great music soundtrack, unlike Mafia this game has radio stations, not just music representing a section in the city. 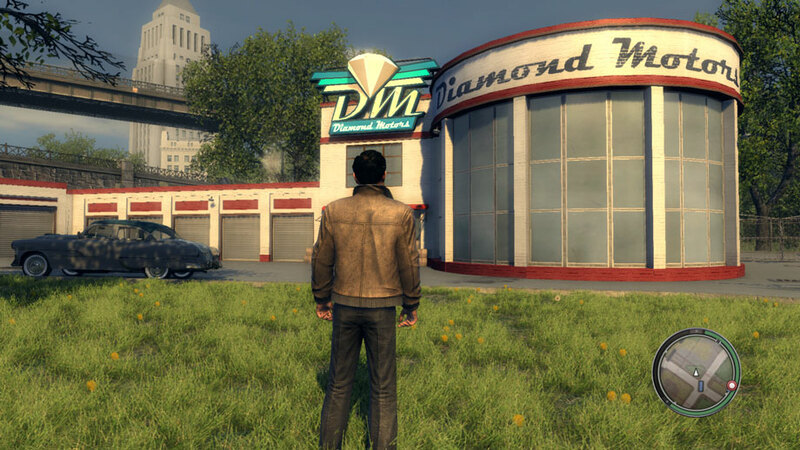 The music used in certain missions is great as well, the game gives control over the music to the player but when necessary takes it away to help with the game’s ambiance. The orchestral music for other parts of the game is great and sets the environment well, this is similar to Mafia in that regard. 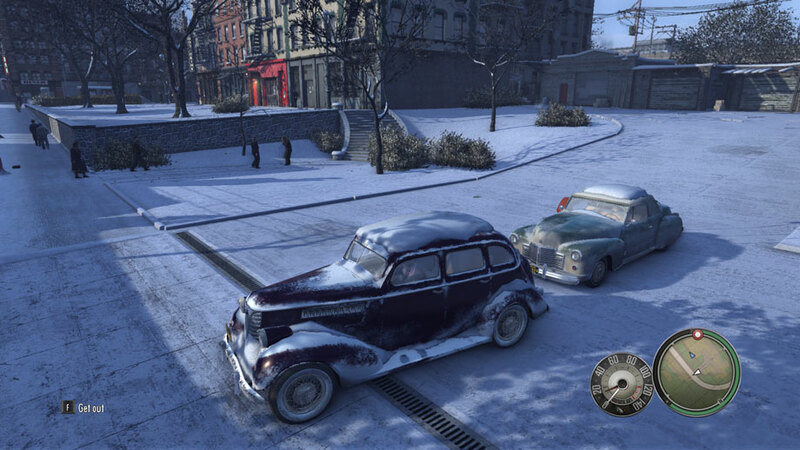 The 40s-50s soundtrack adds a fun factor to the game, it’s fun driving and listening to music and it’s great for a game to use music that is indicative of a time period and is precisely what people listened to, this is a great thing carried over and expanded upon from Mafia. 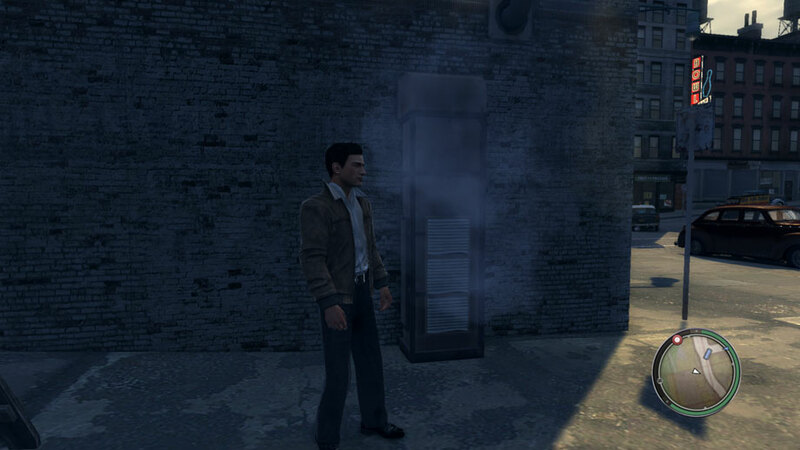 The in-game radio is entertaining, highlighting events through that time period, usually with the hosts stating that something we all use today won’t catch on and that smoking isn’t bad for you. 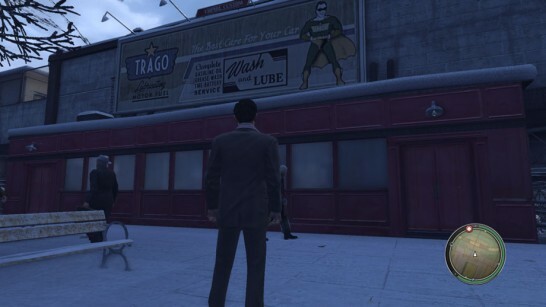 The advertising isn’t too distracting either. 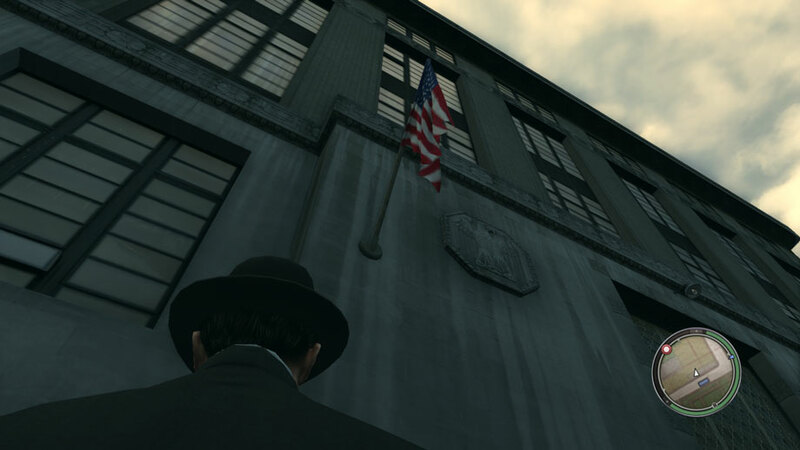 For the most part the voice acting in this game is great, from Vito and Joe, to the old woman that pops up everywhere. The voices are right for the characters and the conversations seem real enough, It just would have been better if they gave some of the lesser characters more lines, or randomised it a bit better. 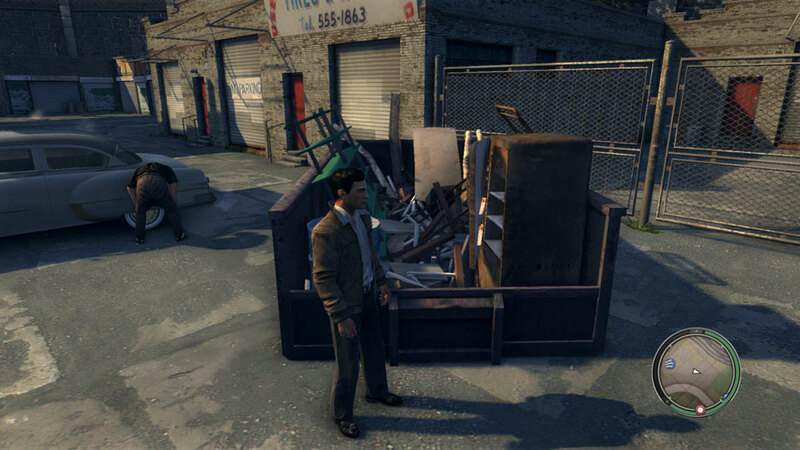 Harry at his gun shop is an example of a character that probably should have been given more lines, buying multiple guns/ammo at once doesn’t end up with a few repeats of lines like in other games, almost every time you click to buy ammo, he says “Like my mum always said, you can never have too much ammo”. It feels as though they could have got more out of the voice actors to make it seem less like the world is populated by the same few people who only have a few lines. 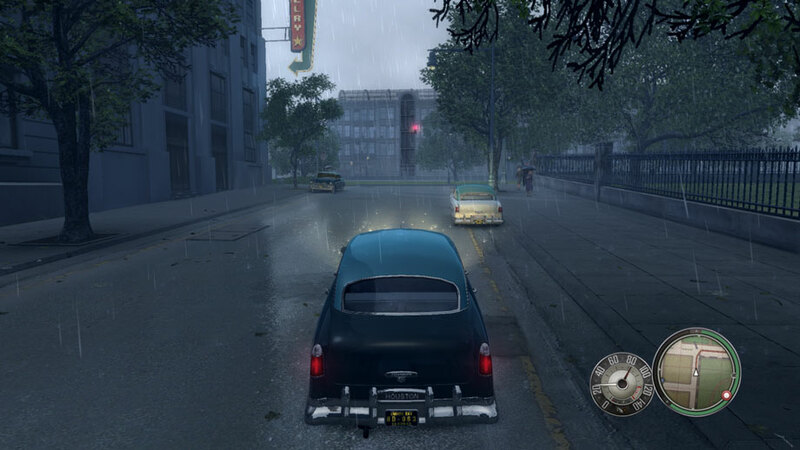 The ambient sound effects in this game are great, almost every section has it’s own unique sound to it and that varies by what the weather is like at the time, an example of what it’s like when it’s raining is above in the graphics section. Developers have been able to make great car effects for years so it’s no surprise that the game does well, each car has different sound effects depending on their upgrade and most cars seem to have unique sounds. This game is fun, after all it is a Mafia game, this game has a lasting quality that most games nowadays don’t have. The game throws you straight into the game without much previous help, everything is learnt during the first chapter in the middle of combat that results in a few tense moments due to either not getting the commands right or simply missing the messages on screen telling you what to do, however it is fairly lenient on the player and there are many checkpoints along the way. There’s not much unique to the controls with this game, they’re fairly stock standard and they work very well, the controls are fast to react and most character actions are quick making for quick reloads and weapon cycling. One problem is the E and F buttons, they are effectively the same button (the action button) except F is used to get into and out of cars, as E is used for the horn?? So when using E most of the game suddenly to do an action you have to change to F for the car. Also when stealing a car F being the default option of seeing that yes, the car IS locked is a bit of a pain, holding F picks locks and Q smashes the window, instead shouldn’t F be smash window and hold F be lock-pick? 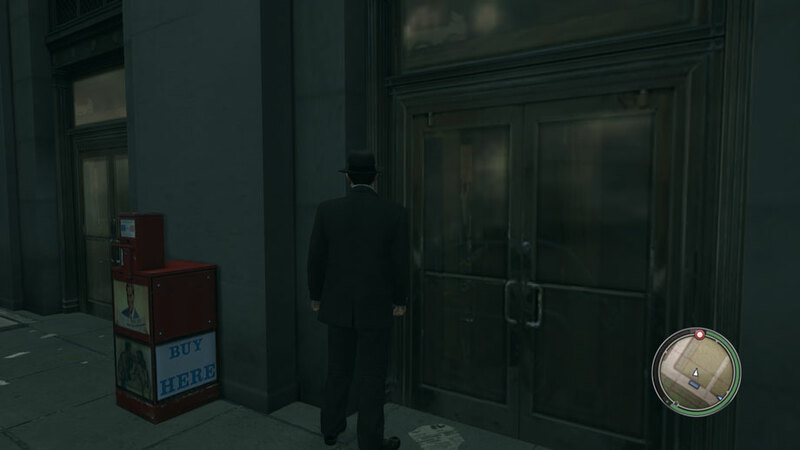 There is no possible situation in a videogame where trying to open a locked door is useful, this is more important however in Jimmy’s Vendetta where time is crucial. The cover system is a great addition to this game over Mafia and it works better than most games, there’s no sticking issues or issues with Vito choosing the wrong spot to hide in, this of course doesn’t always help you avoiding gunfire though. 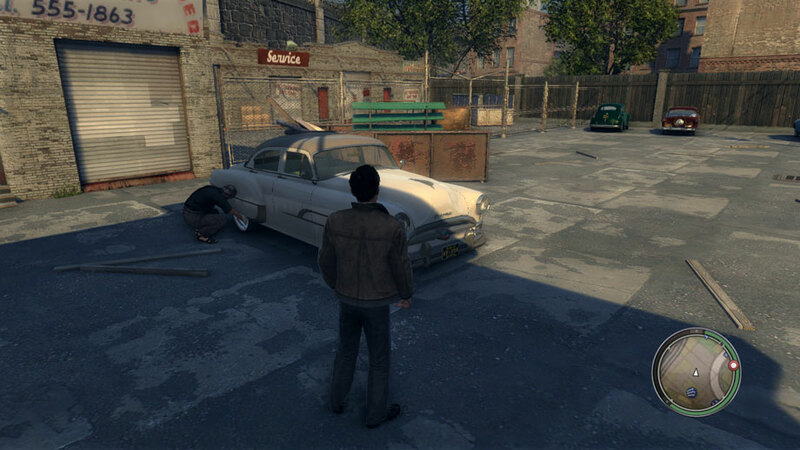 This is a Mafia game so it makes sense there’s melee combat, the only thing more mafia other than shooting tommy guns out of a ’30s car is threatening a store owner with a baseball bat, the previous Mafia had a few melee weapons and it’s not a stretch for most games of this type to have them, so it’s frustrating learning that this game doesn’t have melee combat, it has fistfights but there are no melee weapons in the game. It’s worth mentioning this game did have melee weapons at one stage but they were taken out, either because something couldn’t be fixed before release or they want to charge players for them later on. 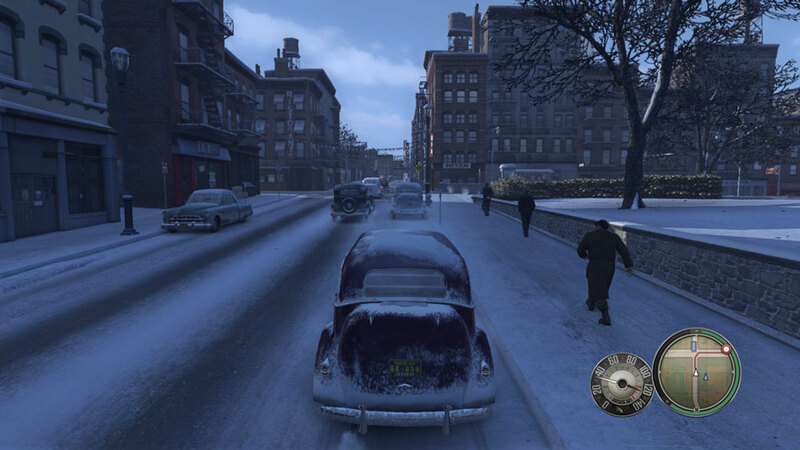 Shooting out of cars is something that didn’t make it into the game either, I’m not much of a fan of missions where they force you to do a drive-by, mainly because the controls are usually really bad, but it’s still something that is standard and should have been included. Car Physics are great, even when APEX PhysX is disabled, here is what it looks like when it’s on though. Something that is missing though is the ability to dive from a car when it is moving, having to stop can be very frustrating when you just want to get out of the car quickly, it’s fairly standard now and should probably have been included. A city needs services, the developers of GTA 3 knew this 9 years ago when they included Fire Engines, Fire Stations , Ambulances, Hospitals and Garbage Trucks in their game that acted as though they were supposed to. Unfortunately Mafia only has a hospital and it doesn’t do anything, I feel sorry for the residents of Empire Bay, they don’t have Ambulances, Fire Services or Garbage Collection even though there’s every evidence that those should exist. Skipping major parts of city services affects the feeling that the city is alive rather than just a collection or people, cars and empty buildings. 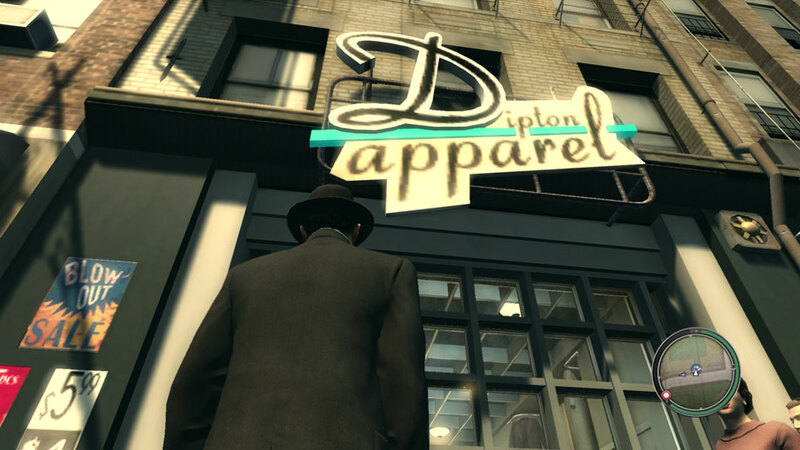 Attack of the clones, this game has a shortage of varied people, consider this situation I stumbled upon, I entered a store to buy some clothes and bumped into a woman browsing the shop, she then accidently bumped into the shopkeeper, who was the shopkeeper? It was herself and she was even wearing the same clothes. 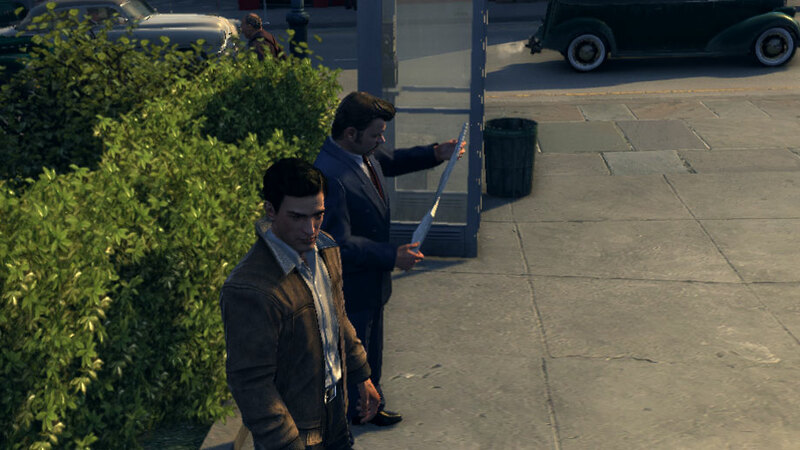 Here’s another situation when taking screenshots of another issue, I didn’t even notice until after I took it, having one smoking and one with different clothes doesn’t stop them being the same person. Where are the trains? 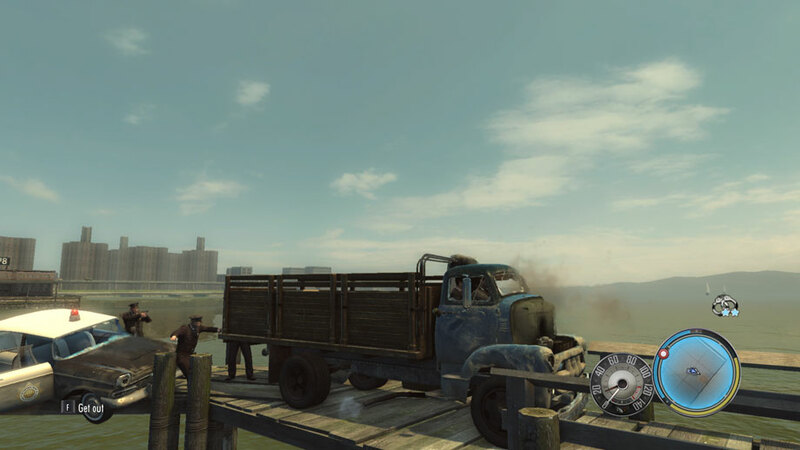 In this gameplay preview from some time ago the game has trains, sure they don’t show Vito riding in them or anything but they exist, after watching the video and playing the game, the area is so dead without the sound of the trains and the view of the trains whizzing around the city, the game has train stations everywhere, it has tracks but no trains. This is unfortunately a blatant case not finishing an aspect of the game, if it didn’t work with the game then it should have been taken out completely, not left half in, either way something hasn’t been finished. Upon reading back through this I was pointed out that there are a few trains in the game, one runs on the outer right edge of the map and is simply triggered by driving close to the bridge it runs on, it’s not exactly what we were expecting though and there are a few sitting at depots doing nothing. Hard times for public transport? Why do the buses stop, but not load passengers… or have any passengers on them? Passengers (like the aforementioned clone) wait for them, they even have ticket machines there, but nobody ever gets on, clearly enough was put in for that to occur but for some reason hasn’t, the inside of the buses are even fully detailed, try looking into a car’s interior the same way and you’ll see blurry base textures. I was able to break the game twice at the start of a level called ‘buzzsaw’. I won’t spoil any of the storyline but for whatever reason you *should* get into a fight with someone, however by 1. running away or 2. shooting the guy you can get out of it, however the game also stops going forward in the storyline, effectively breaking it. Police shouldn’t have been able to track you so easily, what I mean by this is that it’s the 1940/50s, it was hard enough for them to find out people’s identification back then when they had people in custody, how does a police officer immediately know what Vito looks like (height etc) when he’s in a car and how does the last police officer in the area that was just killed inform other police officers about the crime Vito just committed (ie shooting him) when he’s supposed to be dead? 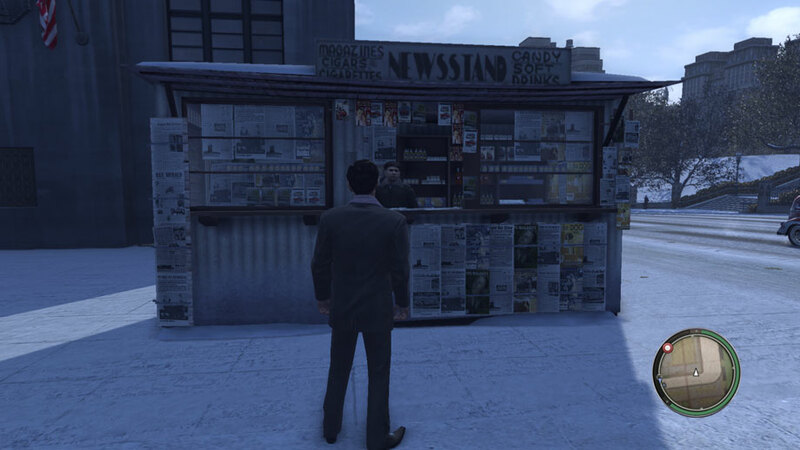 Newspapers are everywhere, people are holding them, there are news stands and news boys everywhere and you can’t interact with them at all. This is apparently another example of something that is said to have been removed from the game, I don’t blame them too much as it doesn’t seem like it would be too useful. What do you mean you haven’t got any? On the subject of cars, there are car lots around but the buildings are empty, the windows are opaque and there are no cars out the front, but there are enough of these around for it to see like they should have been used for something. You’ll also notice that the carcyclopedia appears to be set inside that building. Cars don’t actually run out of petrol, sure the cars slow down but I’ve never been able to get one to stop completely, I can understand how annoying it would be to have your car stop on you but the warning, ie slowing down is still there and gives you ample time to get to the nearest petrol station. This game has a problem with consequences that it just doesn’t see through, the only one that it does see through is the checkpoint system that is just as brutal as the original, a hint, don’t assume that the game is saved when you get to a new section, if you quit you may end up having to play it again. 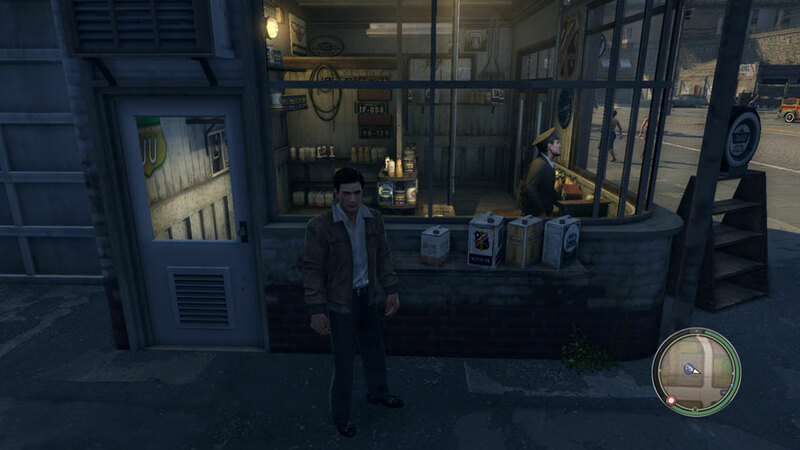 The game feels dead at times and others not so much, there are characters and cars, but there’s not much more to that, possibly due to the previous section’s lackings. People wander aimlessly around, the only time anything occurs is when you cause something to, cars however are different, they will have accidents, the police will proceed to arrest and then get bribed by the drivers, in some rare cases shoot the drivers for resisting arrest. 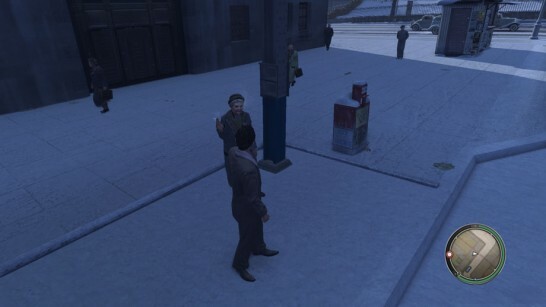 The game actually feels more alive during the snow years, you can even interact with some of the characters in that early section of game, after that they turn into cardboard cutouts that say nothing. There is a small thing that occurs at random and that is the man fixing his car, either changing a tire or working on the engine, this repeats though so it’s much less interesting that it seems. There’s no water interaction, here’s an example of what happens when you try to go into the water. You can jump into it from up high, you splash in and re-appear close to where you came from. Here is what happens when you drive into the water. The water issues this game has don’t stop there, none of the pools have water, they’re out in clear view, they are accessible, why do they not have water in them? The houses in Highbrook and more specifically Willwood hint at areas that might get used at a later date in expansions because they’re fairly un-utilised in the story but they’re perfect for a story of this type. There are birds in the game, they fly around and land on things, they’re not as noticeable/often as they probably should be in the game, but it’s an attempt at some kind of wildlife, unfortunately they game doesn’t have dogs like in the first game, though they were just used as guard dogs. 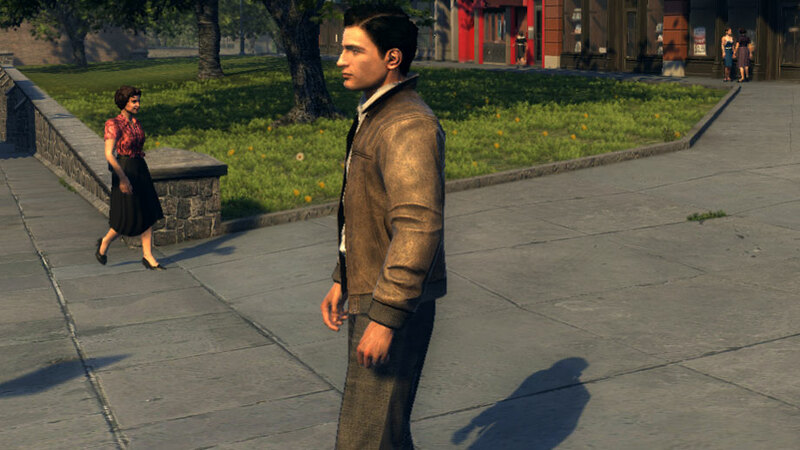 In the story you play as Vito Scaletta, an immigrant that grew up poor in the city of Empire Bay who turns to crime along with his best friend Joe Barbaro in his youth only to get caught, he chooses to enlist for World War 2 to avoid jail time, then when he is out of the war he gets into organised crime with Joe. 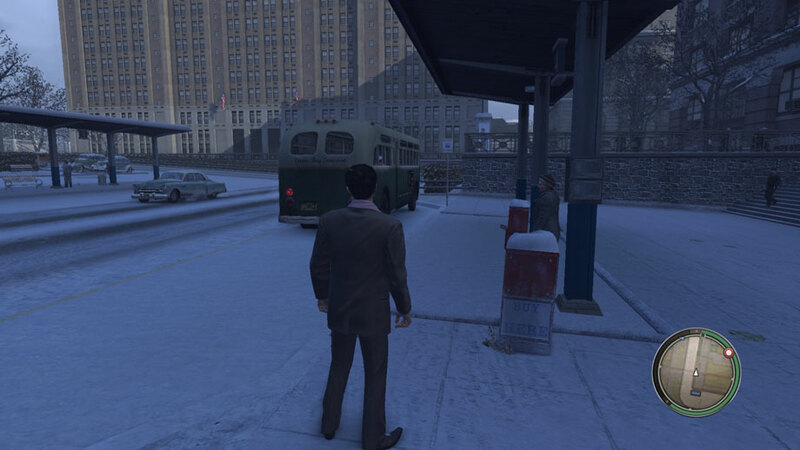 The game does a great job with the story, the cutscenes are in-game with a certain level of filters to make it look nicer, this helps in keeping you in the game, whatever car Vito is in, clothes he is wearing or gun he is holding is shown in the cutscene. 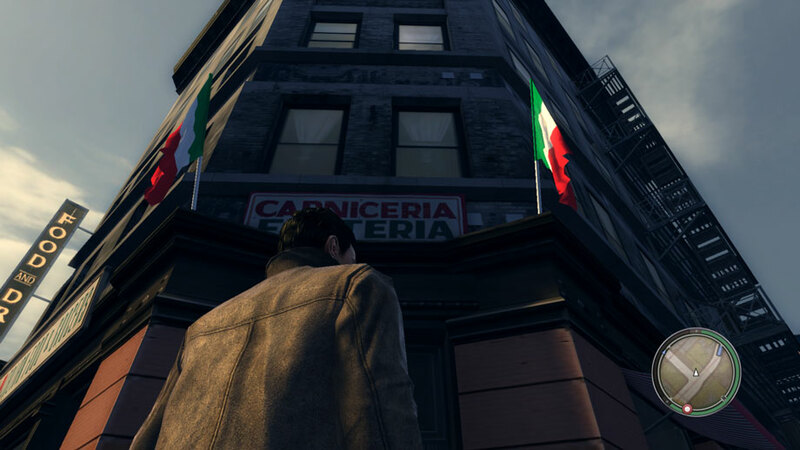 The game is very thorough with it’s backstory, learning about Vito’s father and his situation helps feel at least some compassion for him. Unfortunately he really isn’t a very likable character, he doesn’t seem to care about much more than his own self interests, except for his sister. 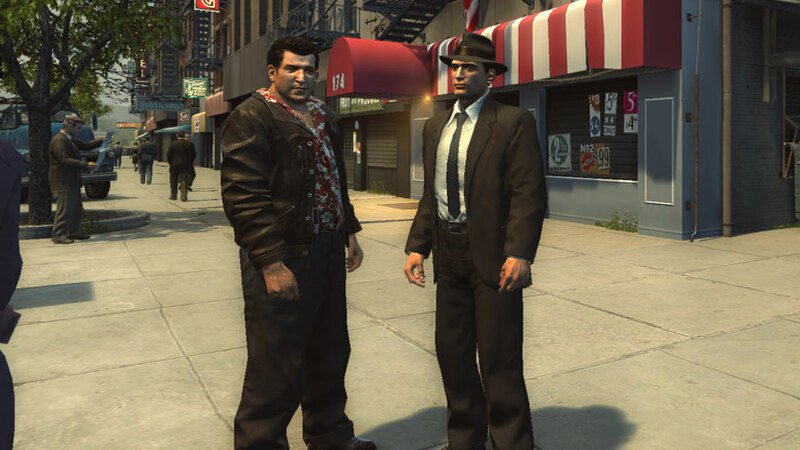 His friend Joe however is much more interesting, bringing a certain amount of fun to the game, even Jimmy from Jimmy’s Vendetta is more likable than he is. There is a feeling that some of the game’s storyline is missing and there is a trailer out there that shows something happening at a church, it was done to the same level as everything in the finished game is but it occurs at no point in the game, the church and what happened at the church isn’t known. This game lacks traditional bugs that plague games made these days but makes up for them with something I can only call laziness bugs. The game’s AA issues have been discussed in the Demo review and in this reviews’ Graphics section so I won’t need to mention it here, but it’s something to note. There are various graphical oddities such as street signs hovering off the ground and grass in odd spots but they’re not really that bad. 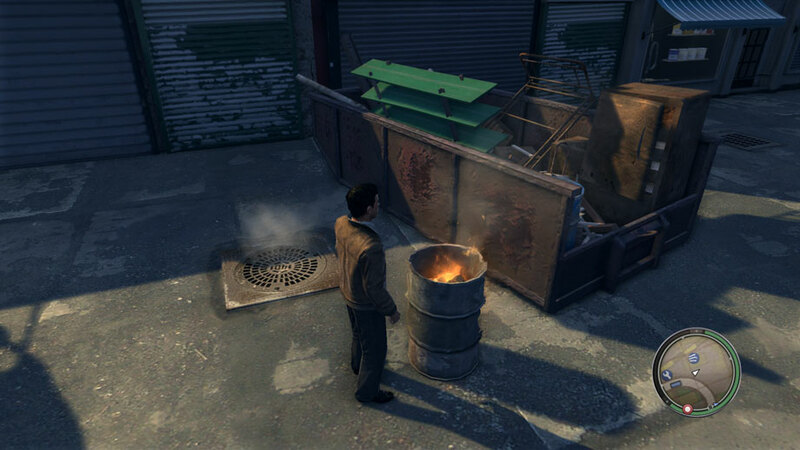 They have done a good job with the graphics of this game, the issues that occur usually do because of the APEX PhysX on the clothes and with the car damage. The police AI varies between being too strict and too soft on you, sometimes you will do somthing and they’ll go after you as much as possible and other times they won’t even pick you up on it. 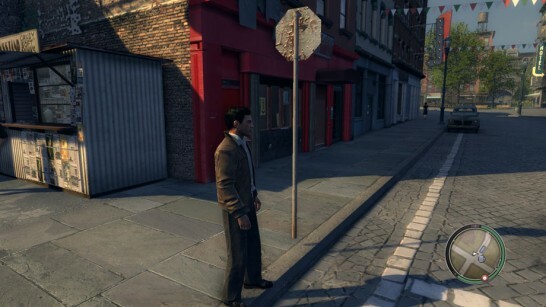 Characters don’t move out of the way for cars, you can be pushing them out of the way but they don’t move anywhere, the horn doesn’t even get them moving. There is something annoying about the car physics and objects that you can drive through, there is a weird pause just as you hit something and the car sometimes moves position at that point as well, here’s an example. There’s no real issues with sound that I can point out. Graphics – Inconsistent textures, feels incomplete, not enough models. Sound – Lack of radio choice. Gameplay – No melee, no water, no diving from cars, strange AI quirks, brutal save/checkpoint system. Bugs – Broken AA, odd graphics anomalies, dodgy AI that don’t move, car physics issues. 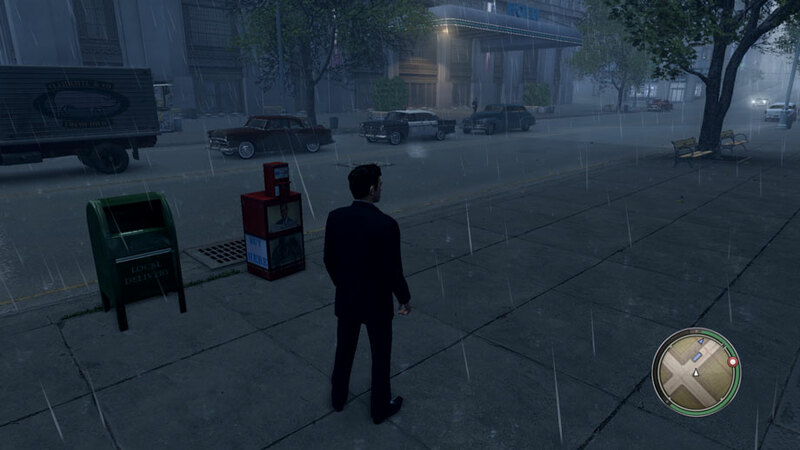 Graphics – Good textures, great effects, rain is awesome, so is snow. Sound – Great, like the original, soundtrack is fun. 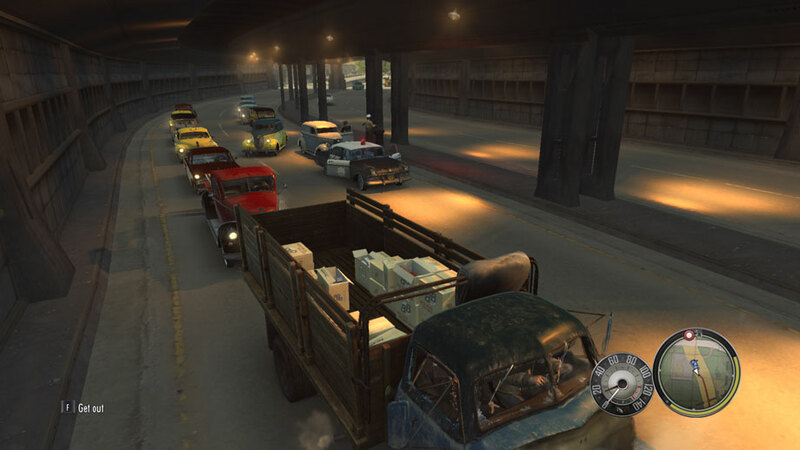 Gameplay – Familiar controls, quick actions, easy car usage. There is so much to this game that I simply couldn’t include it all, each time I tried to think of something else I added it in but I had to stop somewhere. It might seem that I rip into this game way too much, but it’s only because I care. I loved the original Mafia and this game has been long overdue, now that it’s here I just feel that it hasn’t been properly finished and given the kind of care and testing it should have. This game is awesome make no mistake, it is the kind of Mafia game that I had hoped to play, it works, it looks great and it plays great, the story can be a bit boring but it makes up for it in gameplay, I spent many hours just playing the demo, even though it was only one chapter and even now after finishing the game I’m about to go back and play it some more, it’s a thoroughly enjoyable game.